The Community Council has been investigating if more Defibrillators in Colinton would be a benefit to the community. 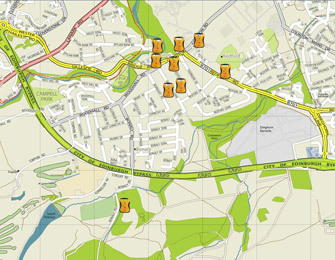 At present we know of four sited in local sports clubs and the TA Centre as shown on the map. Mouse over the image to see a larger version. We want to seek the community's view, so if you have a views on this initiative and know of more defibrillators within the area shown on the map, we'll add further indicators to show these. This is an evolving project and the more feedback we get from the community, the better. Alcohol Focus Scotland recently developed a new toolkit to help people raise concerns about the impact of alcohol in their local community. ‘Alcohol licensing in your community: how you can get involved’ outlines action that people can take about problems alcohol is causing in their local area. It also explains how the licensing process works in Scotland and provides practical assistance for people who want to get involved but aren’t sure where to start. Alcohol Focus Scotland would greatly appreciate the help of every Community Council to get alcohol onto the agenda of all council strategies following the May election. Can you please forward a link to this message to your services and to anyone else as you think relevant? Would you agree that action on alcohol is a priority issue that cuts across many sectors? How would you reduce the impact of alcohol on health, families and communities in your area? What steps will you take to find out about the impact of alcohol locally? It would be great if you could also share with us any examples of work that you are already doing at a local level. Alcohol Focus Scotland has contacted all candidates in the forthcoming local elections to raise awareness of alcohol issues. Emails have been tailored for each candidate with information about their local area - please see below for an example.